Numismatic Guaranty Corporation® (NGC) has announced a new certification and encapsulation service for coin, token and medal dies. As many numismatists know, dies are the tools used in the minting process to strike a planchet and impart the coin’s design. After their useful life is over, dies are usually destroyed by a mint. Sometimes, however, they are canceled and sold as a numismatic product or scrap. These canceled dies are defaced to prevent them from being used to illegitimately strike more coins. Dies that have not been fully defaced and still show part of the coin’s design are particularly desirable to collectors. 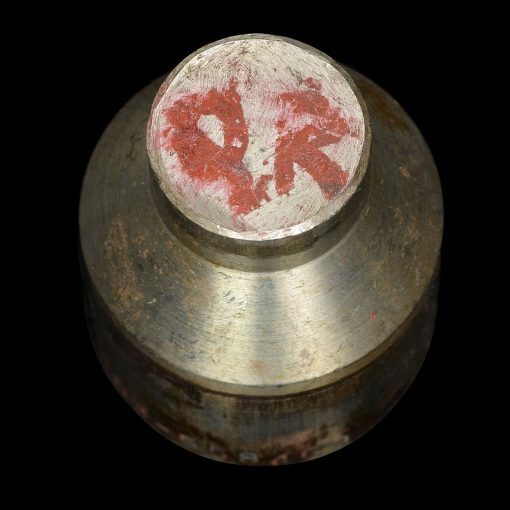 In rare cases, a die may be inadvertently released by a mint without any defacement or cancellation. These dies, which show the coin’s full design, are highly prized by collectors. Defaced dies have had their designs completely removed. While the design has been destroyed, it is usually possible to determine the denomination of the die by the diameter of the face and markings on the shaft or base. 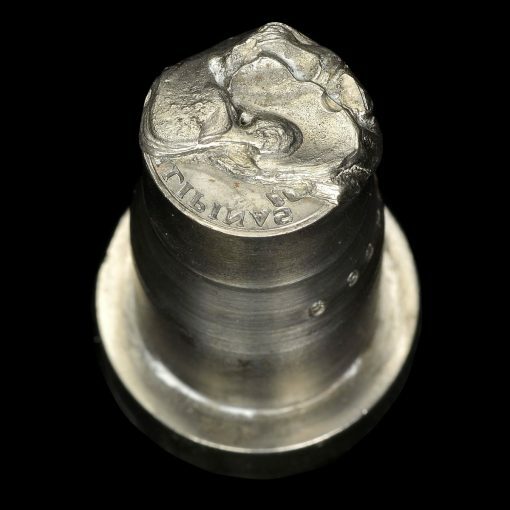 Fully defaced dies from the U.S. Mint are relatively easy to find today as many were sold to collectors in the late 1990s and early 2000s along with a coin struck by the die and a certificate of authenticity (COA). 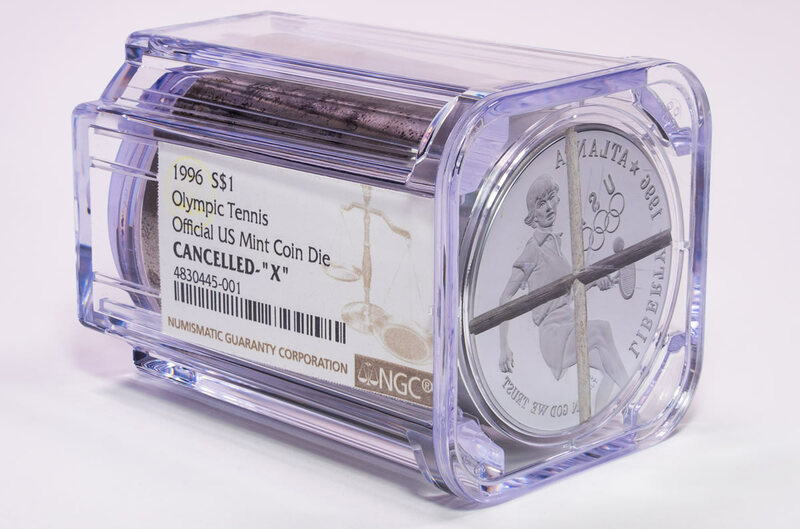 In order for NGC to attribute such a die by date and design, the die must be submitted to NGC with the US Mint’s original COA, which includes the die number (found on the die) and type of coin struck. The majority of the face of a torched die has been melted, leaving only tiny areas of the design visible (if any). 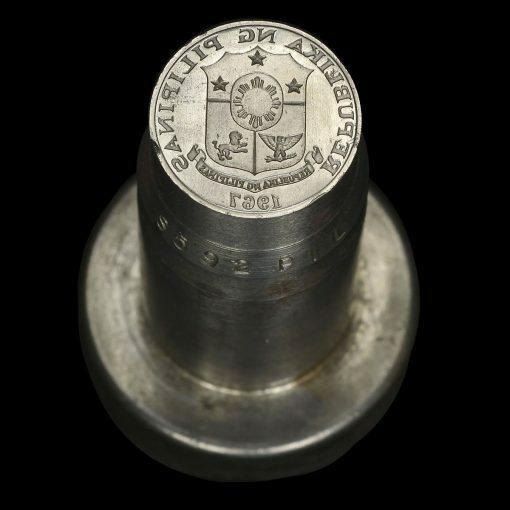 The diameter of the face of the die and/or its markings can be used to help identify the denomination it once struck. Most examples are from the San Francisco Mint in 1968 (most were proofs). After the design area was melted by a blowtorch, the dies were sold as scrap by the General Services Administration. Fortunately, many were saved. An "X" has been ground into the face of the die, leaving the majority of the design visible. This type of canceled die is very popular since most of the design can still be seen. The most commonly seen examples of "X" canceled dies are late 1990s commemorative dies, one of which is pictured below. The generic "Canceled" category includes all other types of cancellation used by mints. This includes partially defaced dies, such as the Mercury Dime obverse die pictured below. These dies have no evidence of cancellation. 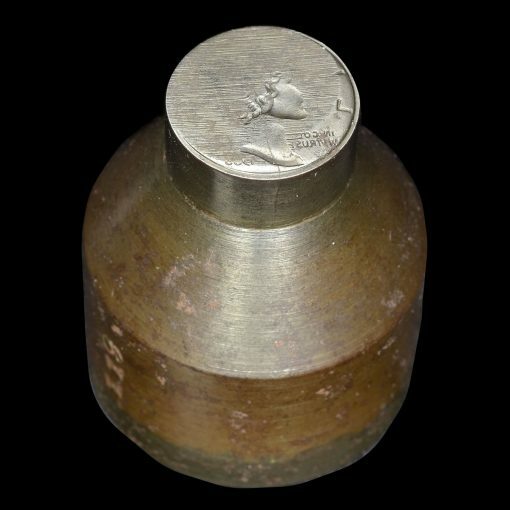 These are the rarest type of die, as they are seldom released. However, this 1967 Philippines 10 Sentimos Obverse Die, pictured below, is an example. Fred Weinberg, an error coin expert and dealer in dies, sees great value in this new program. "NGC has invented a solution to market the quantity of official U.S. Mint defaced coin dies that I own," he said. "Now, instead of just looking like a nice paperweight, the NGC encapsulation helps display all sides of the dies and includes the NGC Label with a full description of the enclosed die." 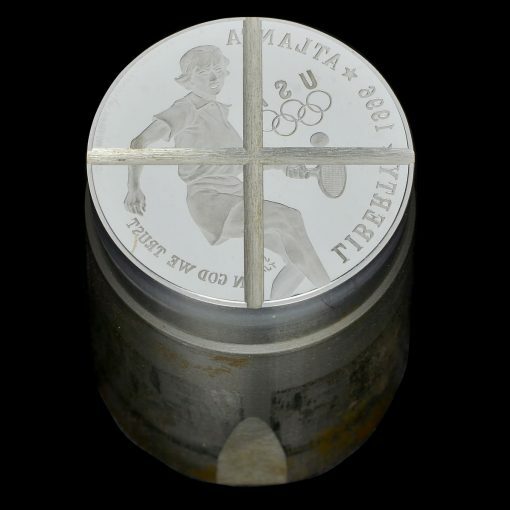 Dies submitted to NGC for certification will be encapsulated in NGC’s clear, tube-shaped holders. Comprised of high-quality, inert materials, these holders are designed for long-term preservation and superior display. Each holder is ultrasonically welded with an internal label that features a description of the die as well as a unique NGC certification number. NGC’s holder (which is included in the certification fees listed above) can accommodate dies that are up to 40.6mm wide and 59.6mm tall. Dies that are too large to be encapsulated can receive an NGC Photo Certificate, which features high-resolution photographs of the die along with a description and unique NGC certification number. Dies from all countries are eligible for this new program at the same prices listed above. To submit, use a standard NGC Submission Form and write the category of cancellation in bold letters at the top of the form. Submit each category on a separate form and do not mix coins with dies on the same form. Counterfeit or altered dies will not be encapsulated and the full grading fee will apply. For dies that are of questionable authenticity or that otherwise cannot be certified, the grading fee will be refunded less a $5 handling fee. For questions, contact NGC Customer Service at 1-800-NGC-COIN (642-2646) or Service@NGCcoin.com. NGC has certified more than 42 million coins, medals and tokens. Founded in 1987, the company provides accurate, consistent and impartial assessments of authenticity and grade. For more information about NGC and its grading services, visit NGCcoin.com.